I know we are always looking for the next great video card or the fastest processor to make our computing experience even more enjoyable. Eye popping graphics, blazing frame rates, near pre-cognitive response times are often times all we think of ... I know I do. 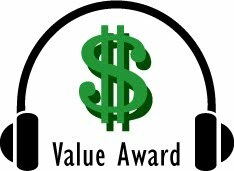 Interestingly enough one area we often neglect or flat out ignore is the audio experience our computers can provide … or not provide. 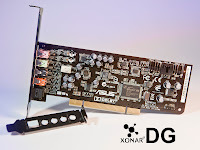 I was pleasantly surprised when I slipped in the ASUS Xonar DG PCI sound card to one of my testing rigs and was blown away at what my ears had been missing. Suddenly the sound became bigger, louder and at the same time softer and crisper. Subtle sounds and details that I hadn’t noticed before could be picked out distinctly and clearly. Now keep in mind this was not as good as sitting in recording studio with some high end audio equipment but it was significantly better than the stock audio that came on the motherboard. Probably my favorite feature this card has is the built in headphone amp, which as it turns out is reason enough to buy this card. If you ever use headphones for gaming or listening to music and all you have is the built in audio that came with your motherboard you have to get one of these cards! As with most gaming or quality headphones they have larger speakers in them with more powerful drivers (magnets) that create a higher resistance (ohms) and require more power (watts) to move them and create the sound. Most built in audio cards can only handle up to about 32 ohms at best. The Xonar DG can handle up to 150 ohms and that really makes a significant difference on the quality of the sound you will get from your headphones. Another quality I noticed with this card was the reduced noise or hiss during the quiet lulls in the audio playback. This is due to the impressive 105 dB signal to noise ratio on this card. One way to explain the signal to noise is think of the hiss and pops as a raging river, the further away you are from the river the less you are going to hear it. Same thing with SNR, the higher the dB rating the less noise you hear because it is “further” away from the noise, not bad for a card that goes for less than $40! Drivers for the card seem very stable even on 64bit operating systems. I tested it on Windows XP 32bit and 64bit and Windows 7 home premium 64bit and had no trouble with installation at all. One thing that was missing was ASIO support (improved latency for recording/playback) for your audio editing programs but with a quick visit to the ASUS website you can get an updated driver that supports this functionality. If you use any professional recording software like Adobe Soundbooth or Cuebase (to name just a few) this card/driver combo will do the job. 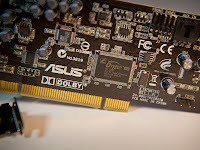 Keep in mind ASUS has many other flavors of the Xonar cards that are suited better for these types of applications. If you do even some occasional recording you may want to pay a little more and jump up to another Xonar card better designed for recording. The Xonar DG does support Dolby Headphone which delivers realistic 5.1 surround sound to your stereo headphones as well as Xonar GX2.5 which is emulated support for Creative’s EAX gaming audio format. Both of these technologies really expands the sound field and can produce some cool audio effects. It will playback audio up to 96KHz/24bit and record at 48KHz/24bit which is suitable for most user needs. Higher end cards will playback at 192KHz/24bit and record at 96KHz/24bit, just for comparison. The Xonar DG comes with an optional low profile backplate for use in a compact case or home theater PC and a standard driver cd for Windows XP, Vista and 7 (32 and 64 bit). 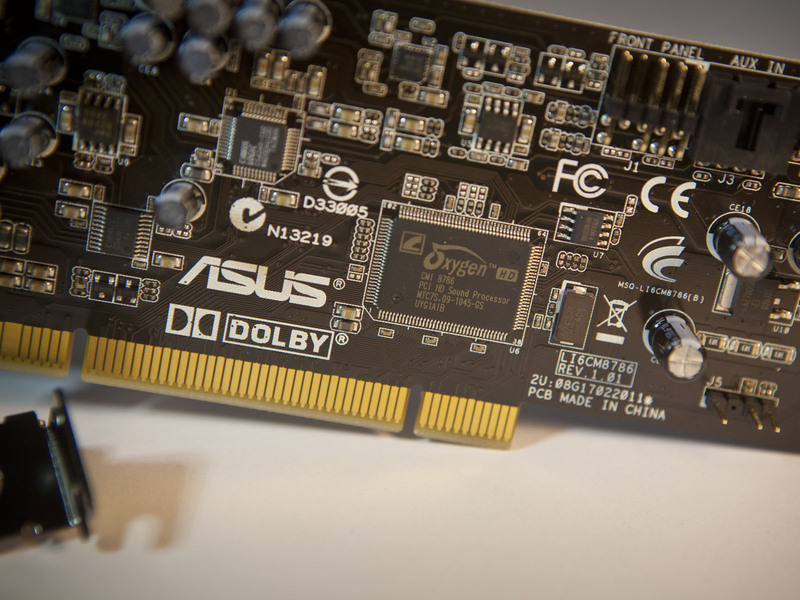 It is a PCI board so you will need an available PCI slot on your board (v2.2 or higher). As far as connections go you have the standard 3.5mm plugs that are all well built and not too flimsy. You have the pink for Mic/Line in, green for headphone/front speaker out, black for side surround out and orange, center/subwoofer out. 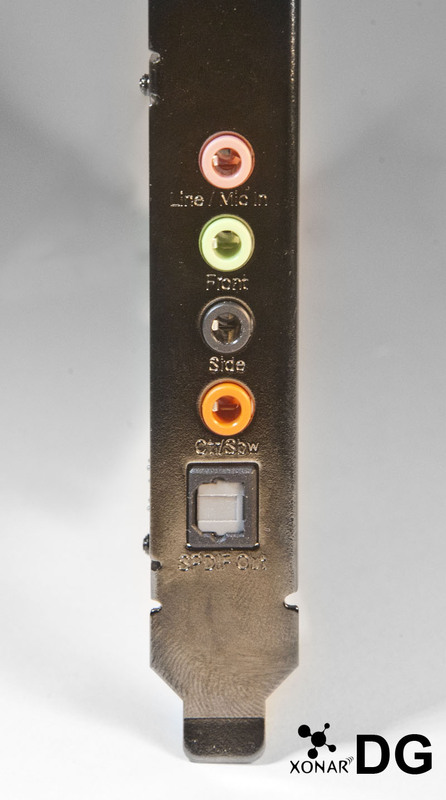 You would use these ports to connect your powered 5.1 surround sound speakers to the card. There is also an optical out port that would be best suited for connection to an external AV or Home Theater system. There are also additional connections for components such as a TV tuner card or other internal sound sources located inside your computer. Another nice feature is the auto-sensing front panel jack connection that will automatically switch the input/outputs to the front when something is plugged into the front case jacks which is very convenient for headphone usage. Your case will need to have the appropriate cables and front panel 3.5mm ports to support this feature (9-pin Intel AC-97). 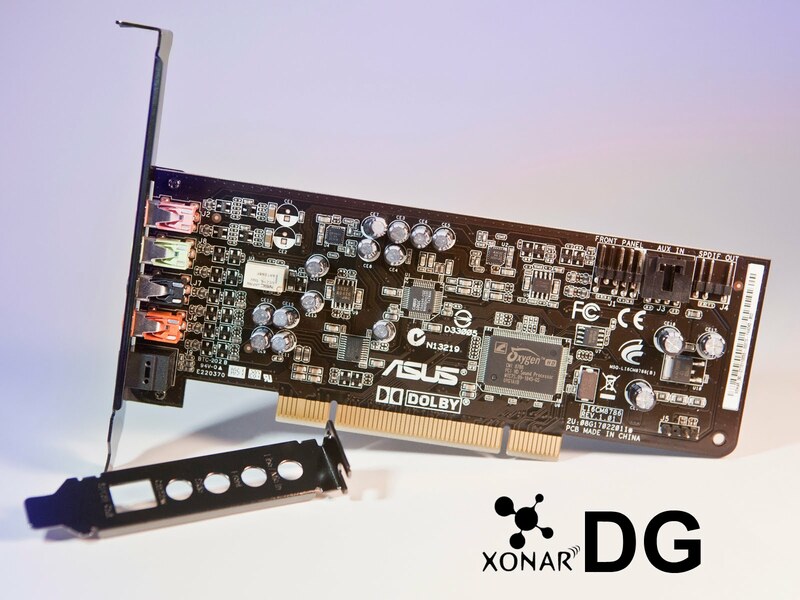 The ASUS Xonar DG is certainly a great value for what you get. ASUS did not disappoint with this product and it lives up to the expected ASUS quality standards. While the 5.1 audio might be a little dated it works well for game play and casual music listening and provides a great alternative to on-board audio. With the great signal to noise ratio, built in headphone amp and the great sound this card produces it certainly provides high quality audio, that we may not even know we are missing, at a very reasonable and affordable price! Based on its features, quality, and performance, the Asus Xonar DG has earned our Value Award. Congrats! For more info and complete specs, check out their website at www.asus.com.